From our the Cosmic Self shall ripen. We have made a few cost saving changes at the Office for everyone to take note of. The only landline in to the Office is now the main number of 5479 2000. We no longer have a fax machine or any other old numbers you may have in your phones. The Absentee Line remains the same. 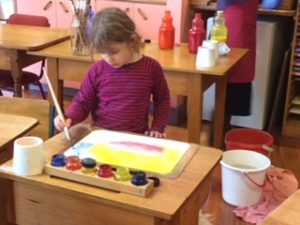 We are currently advertising for a Class One Teacher for 2019. Please refer to our website for full details. Applications close Monday 17th of September 2018. 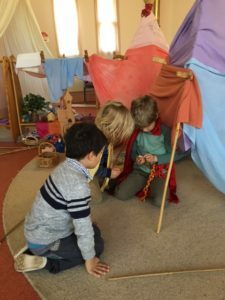 Thank you for coming to the recent parent evening. There was a great turn out, it was lovely to share the evening together. Especially lovely to share the children’s morning circle with you all. Well done to everyone for singing! I have enclosed a summary of the evening in your parent pockets. Please note the date of the upcoming working bee on Wednesday the 5th of September. There are some specific projects that are being organised. Stay turned for more information . We are now in Spring, officially. It feels like it has been tempting its little green fingers into the cold air for a few weeks now. We will leave behind King Winter and the Gnomes and Dwarfs digging deep into the earth and start to do our Spring cleaning morning circle. Our festival this term will be at 9.00am on the last Thursday of term. I will send home an invitation in the coming weeks. Amie will return to us for our last week, so that will be nice to see her again. A big thank you to Rose and Sally for all their er help with the children whilst Amie is away. 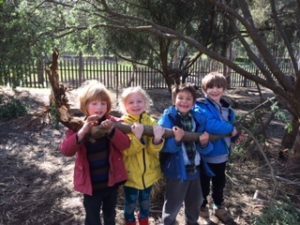 The children have been a delight to share our days with as always. Special thanks to Christine and Rebecca for caring for the children so well while I was on leave. It was a very restful and enjoyable break but also lovely to return and see the children this week. Our garden is bursting into life with blossoms, violets, bulbs and new leaves beginning to appear. In Morning Circle we have begun to sing some of our Springtime songs. 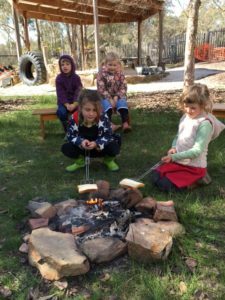 The children had fun this week cooking toast on a campfire. Sherene and Bron have been our wonderful class carers this year. Sherene has become a bit busy with work so Ada has very kindly stepped in to work with Bron at this busy time when the Spring Fair approaches. Thank you Ada. And of course very special thanks to Sherene for your communications, support and help this year, we all appreciate your efforts. Our Spring Festival will be on the last day of term, Thursday 20th September, 8.45-11am. In Class 1 we have many lovely stories. 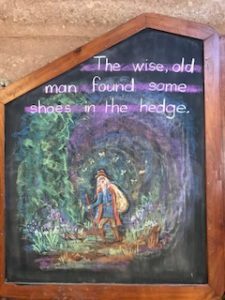 Here is one about a wise man who find a very special pair of shoes. We have been knitting, and painting and been very enthusiastic about outside working bees! We have two new families in our class group -Welcome to the Freedom family and the Ramos Family. In class we are busy learning about the History and Settlement of Australia. 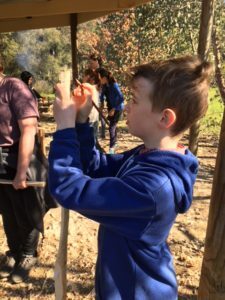 We begun with the Jaara People of our area and the Aboriginal language groups of Victoria. This has then lead us to the arrival of the Endeavor and later the First Fleet. The children have been very busy drawing maps and writing from various perspectives. We are getting very excited about our upcoming camps!!! Please spend some time looking through the list of things to pack and remember no jeans on the Terrick Terrick camp!! We have had a colourful and adventurous fortnight in Class 7. In Main Lesson we have begun to explore the edges of the known world, and to face terrifying notions of boiling seas, hungry monsters, and sun so hot it will burn a boat to ashes, as the first voyages of exploration set out from Portugal, hoping against hope that the seas would be kind, and a way would exist to access the riches of India. 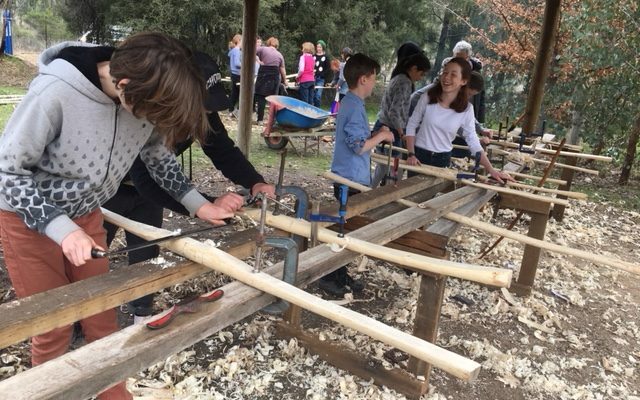 We were very blessed to have Evan return to guide us through making our longbows. It was three days of joyous hard work and togetherness. Sadly tragedy struck for some, as they bent their bows for the first time, and heard a heartbreaking snap! 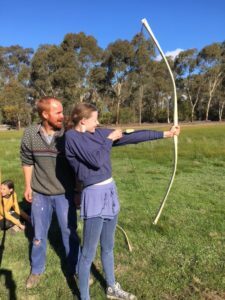 Some bows are yet to bend for the first time; we have our fingers crossed they will remain in one piece, as it is not an uncommon thing for a young bowyer shaping his or her first bow. 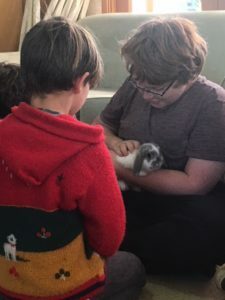 On Monday afternoon Tyber’s mum, Rakaia, and younger brothers, Zuri, Phoenix and Atlas, brought their new rabbits to visit, and told us a lot about them. What I lovely way to finish the day! Thank you to Tyber’s family for this treat. 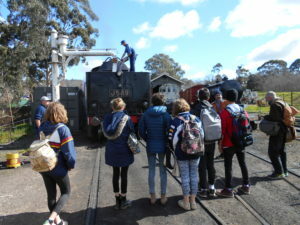 Students of Class Eight have been busily completing a Main Lesson on the Industrial Revolution over the last few weeks, culminating in a trip by steam train from Castlemaine to Maldon, where we enjoyed an extensive tour of the railway workshops and climbed aboard the lovely old steam engine before turning it on the turntable and completing our journey home! We are also pleased to see all the hard work coming together on our class project for the fair. Our knitted blanket is slowly taking shape at last! Sincere thanks to our dedicated knitters, especially Class One, Two and Three students,Cathy and the inexhaustible Lynn Wallace! We will of course be raffling our blanket to raise funds for helping homeless young people through ‘Frontyard,’ a division of the Melbourne City Mission which supports young homeless people under 25 throughout Victoria. Great to see so many of our very fortunate young students helping such a good cause. Look out soon for the completed blanket in the school foyer and an opportunity to buy a ticket in our raffle! 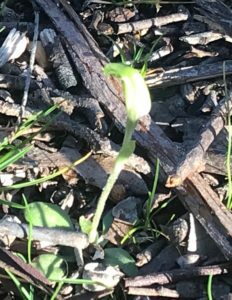 Our beautiful greenhood orchids are flowing! Class 3&4 have become River Detectives! 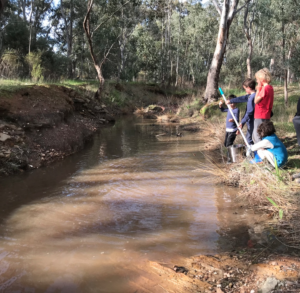 We are monitoring water quality in Bassett Creek which runs through our school. We are looking at all sorts of measures like water bugs, salinity, turbidity, phosphates etc. The upcoming holidays are a great time to look through your house for fish and dip donations. Little treasures like coins, stamps, crystals, stickers, ribbons, bells. crayons, pencils – all these odds and ends can be turned into treasure. It will greatly help the class two parents who are tasked with wrapping hundreds of these little parcels if you can gather up your donations and put them in the box in the office or leave them in the Parents Room. Jane McCahon is once again running the second hand clothing stall at the Fair. These will be good quality clothing and bits and pieces, so if you have something that’s perhaps a little too special for the op shop, you could leave it in Jane’s basket in the Parents Room. We are still keen to find someone to help us create a new poster for the Fair. We have so many budding and accomplished artists, I’m sure there’s someone who can create something that beautifully captures our Fair. If you’re keen, please let us know in the next week or so. The Spring Fair Working Group is working with class carers on their class activities. If we haven’t had a chat we will soon! The raffle hamper ideas (from class 1-8 parents) are coming along really well. I’m really looking forward to seeing the hampers gathered together in the lead up to the Fair. We’re getting into a routine with the lunches – just in time for the last few weeks of term. 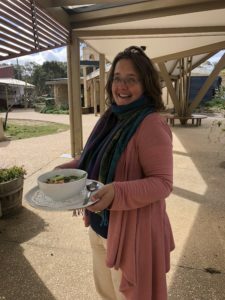 Thanks to everyone who has been helping out – a special thank you to the lovely Natalie who each week helps us deliver soup to the children after a busy morning working in kinder. Join Castlemaine Health’s community strategic planning event on Wednesday, 19 September. A light meal will be provided. We look forward to seeing you there. Castlemaine Library is eggcited to announce our new science program, Eggs Alive! From Monday 3 September, we will have 20 fertilised eggs in our new incubator, and will be hatching chickens in the Library during the school holidays! Come along and observe the chicks hatching, join our special chicken-themed school holiday activities and Story Time sessions or browse our poultry-themed display – we’d love to see you! I am looking for bee swarms- please contact me if you know of one- I shall come and collect and provide them a good home! We live at 17 Westbourne Drive, Wights Mountain which is within walking distance of the Samford Valley Steiner School in Wights Mountain. We have our house on the market for sale. Our four sons have all grown up and moved on and we find that the house is simply too big for the two of us although we have thoroughly enjoyed living in such a beautiful rural area for the past 25 years. I thought given its close proximity to the Samford Valley Steiner School I might let you know in case you may know of a family that may be relocating and wanting to purchase a home close to the school. It’s a home that would possibly suit an inter-generational family as it is in essence two homes – the main house with a guest house attached. We built on the guest house for my elderly father who lived with us for seven years. Should you require any further information please don’t hesitate to contact us. An eco spirituality day - "The leaf has a song in it"
A 4 bedroom furnished house available for rent in Wesley Hill. Functional kitchen, lounge and dining, renovated bathroom, fruit trees, chicken pens and vegetable gardens $420/week. 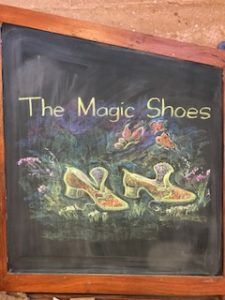 This is a nourishing and fun day of creativity, inspiration, connection and healing. We will gather in sacred circle to make a spirit / medicine doll. Weaving in intention and blessing, connecting with your ancestors, guides and teachers, with the realm of nature and this land. ~ anything special you feel called to incorporate into your doll. You may have special feathers or a doilie your great grandmother made or a precious piece of jewellery. ~anything you may need for your own comfort and warmth for sitting in circle for the day. Cushions, sheep skin, shawl etc. ~ something light to share for lunch. Save the Date - Castlemaine Billycart Challenge! 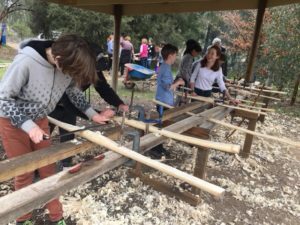 Castlemaine Billy Cart Challenge – Sunday October 14th, 2018. With only 12 weekends till the big day it’s time to get busy billy cart building! Past student instrument purchased through CSSK Music Department. It is a full size Violin strung as Viola, with Viola bow (recommended as not as large as full size viola).